Swami Amar Nath Ji Yatra is the most hallowed Hindu pilgrimage of Northern India in the state of Jammu & Kashmir. 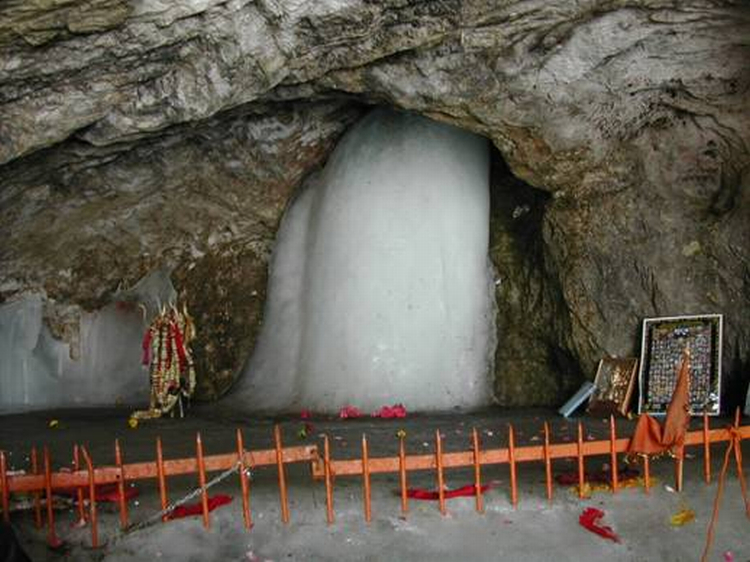 The pilgrimage attracts lakhs of devotees annually from various parts of the country in the month of Shravan (July-August) to pay their respectful obeisance to Lord Shiva which is in the form of ice-lingam formed naturally of an ice-stalagmite in the cave at Swami Amarnath Ji in South Kashmir. The Amarnath Ji is considered to be one of the most revered Hindu Dhams and the holy cave to be the abode of Lord Shiva. Since the Yatra assumes colossal importance nationwide, it is imperative upon every devotee to have a cursory knowledge about the history of the Yatra. It includes the knowhow of various religious places situated en-route to Holy Cave through Baltal and Pahalgam routes. It is worthwhile to mention here that quite a few across the country know about another pilgrimage of Lord Shiva in the same district of Anantnag popularly known as Chotta Amarnath Ji situated in a hamlet of “Thajwar” about seven kilometres from Bijbehara town. There is a cave of Lord Shiva on the hill-top thronged by the pilgrims on the day of Shrawan Purnima, coinciding with the day on which the two-month long annual Swami Amarnath Ji yatra concludes. It is believed that a shepherd was given a sack of coal by a sage. After reaching home, he discovered that the sack in fact contained gold. He was elated and straightway rushed back to the sage to express his gratitude. Instead, he saw a miracle and could not believe his eyes to find out a cave there. Since then, the Holy Cave became a place for the annual pilgrimage. The shortest route to perform the mountainous pilgrimage of Swami Amarnath Ji is taken through the Baltal in Ganderbal district of the Kashmir valley. Baltal is about sixty kilometres away from the summer capital of the state viz Srinagar and about fifteen kilometres from the famous tourist destination Sonamarg. From Baltal, one has to traverse through narrow terrain along steep cliffs till confluence of streams at Sangam. Moving forward, pilgrims are required to travel on the slippery track over primitive glaciers for about three kilometres before reaching to the Holy cave of Swami Amarnath Ji. It has been by and large seen that the weather on this route remains inclement and torrential rains lash over the area frequently posing enormous inconvenience to the devotees. Unflinching faith shields the visiting pilgrims from inhospitable weather conditions while taking this route that is less preferred. The majority opt for the Pahalgam track. The Baltal Route gives an opportunity to pay obeisance at Holy spring of Mata Khir Bhawani temple located in Ganderbal district. It is believed that the colour of the spring changes if any untoward incident is about to happen as a premonition of an impending doom. The recent impending indication was seen last year in the month of June 2014 when the colour of the spring had changed to red and thereafter floods ravaged the Kashmir valley in the first week of September 2014. While taking the route via Pahalgam, pilgrims can have an opportunity to visit Raghunath Ji temple as well as the renowned Sun Temple in Martand located in the district Anantnag. World famous hill station Pahalgam is the base camp of the yatra that is about 100 kilometres away from Srinagar. From here, the pilgrims have the option to travel either by road or on- foot. Pilgrims make it a point to visit the Lord Shiva temple situated on the embankment of famous Lidder River. One more ancient temple of Lord Shiva called Mamal Temple is situated on the hilltop across the Lidder River and is also worth a visit. Pahalgam town enveloped in the snow-clad mountains and the dense cover of forests is a treat to the eyes. It is believed that Lord Shiva left his ride, Nandi – the bull at Pahalgam and proceeded towards the Holy cave. The place was known by the name of Bel Gaon and with the passage of time is being known as Pahalgam. When the yatra proceeds from base camp Pahalgam, the first halt (Padav) is about 16 Kms away at a place known as Chandanwari. The road leading to Chandanwari is motor-able. To reach this spot, one can board the public transport available on reasonable rates fixed by the local authority. The trail runs along the Lidder River with a most fabulous and mesmerising scenic view. It is believed that Lord Shiva massaged his forehead with sandalwood powder (Chandan) at this place hence deriving its name as Chandanwari. After reaching Chandanwari, the yatra proceeds towards Pishu Top through a very difficult and challenging track. One feels quite ecstatic to traverse this arduous track while chanting ‘Har Har Mahadev’ by virtue of which this hazardous track seems quite easier. After completing this leg of the journey along the steep mountainous slope, the devotees halt to take rest to reenergise themselves. Next phase of the holy journey is a backbreaking steep zig-zag trek towards the Mahagunas Top that leaves the pilgrims breathless due to high altitude and lack of oxygen. Some pilgrims may experience nausea as well. Dry fruits, sour and sweet eatables like Lemon may prove to be helpful in such a situation. All along the route, medical facilities free of charge are available for those pilgrims who require any medical attention. Moving forward, the track descends to the meadows of Posh Pathri richly covered by wild fragrant flowers and herbs. But it is said that whosoever halts here for some time falls into a deep slumber because of this intense fragrance. So it is advised not to spend more time at this spot and proceed towards the next halt at Panjtarni. Panjtarni is enveloped by five snow-clad peaks where the pilgrims take rest and stay overnight. In the wee hours next day, the yatra proceeds towards the final destination, the Holy cave – the abode of Lord Shiva. On the way to the Holy Cave, one comes across the confluence (Sangam) of Amravati and Panjtarni streams. The pilgrims take ablution at Amravati near the Holy Cave before paying the obeisance. The Chadhi Mubarak finally perform the Darshan of Swami Amarnath Ji on the day of Shravan Poornima (Raksha Bandhan). This marks the concluding of the holy pilgrimage that is visited by lakhs of devotees from across the geographies. In 2014, about 3, 72,909 yatris had performed the pilgrimage. The step-by-step procedure which the Yatris need to follow to register for the Yatra has been put on the Shri Amarnathji Shrine Board’s website. The website also contains the application form and state-wise list of Bank Branches with complete addresses which the Yatris can approach for registering themselves for this year’s pilgrimage. Note: Article is written by Sunil Kaul, Media & Communications Officer, PIB Jammu.